It is easy to become an artist when you grow up in an environment that encourages creativity. I was raised in just such an environment, and the series of posts ahead is a bit of a tribute to the gifted artists in my family who have given me so much. 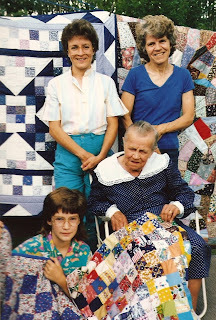 My great-grandmother made crazy patch quilts until the year she died, and in an era where sewing and quilting had become a hobby more than a necessity, her handcraft was clearly her creative outlet. A house fire years after her death destroyed decades of Grandma Dyck's journals, but few of her children, grandchildren and great-grandchildren do not have her handiwork in our homes, even if just a potholder or a placemat, painstakingly handstitched. The "bear track" stitch always reminds me of my great-grandmother. It's interesting to me that something that was once just another task, when the necessity is eliminated, becomes a gift, an act of expression. We see this not just with textile art (like quilting and knitting) but with papermaking, letterpress, blacksmithing, calligraphy, traditional woodcraft, even lace-making. In my great-grandmother's case, a girl from a Mennonite farming family, a woman who raised twelve children in poverty, you would think that once the kids were raised and sewing for the family was no longer necessary, she'd invite the neighbourhood to toast marshmallows over a sewing machine-fueled bonfire! Some would say we revive these lost arts as a way of connecting with a simpler era, and that may in part be true. But I don't believe that handcraft will ever become obsolete. In each of us is the desire to create, to put our hands to something, and often, to give.